Ron just pointed out that yesterday I said we looked at shelter websites on Sunday. That was Saturday, and we brought Pippin home Saturday evening. Which you probably deduced, but I went back and corrected the entry anyway. I actually cooked last night for the first time in, um, a long time. Since before it got disgustingly hot. About mid-afternoon my brain suddenly said “Pork chops with long-grain and wild rice!” (a staple from my childhood). I couldn’t think of a reason not to, so I picked up Robin on my way home and we did the grocery shopping at Eurofresh (don’t trust Jewel/Dominick’s for fresh pork). I didn’t get pork chops, technically; I got pork cutlets. And two boxes of Uncle Ben’s Original Recipe Long-Grain & Wild Rice. It was yummy, even if the pork was a bit over-cooked. I think Ron was a little disappointed, he’d suggested rice pilaf when I asked for shopping suggestions. But we’ll have that tonight. Pippin was mystified by the process of doing dishes and cooking, but he was willing to help with the cooking part, especially the meat. He’s very good at being under foot in the kitchen, but at least he’s fast and maneuverable, besides being smaller than Eowyn was. Last night was educational for Pippin. He figured out what the back yard is good for when not on a lead: running around like a loon. Did I mention that he’s fast? He and Ron were playing chase (well, Pippin was playing chase, Ron was mostly staying in one spot pretending he was going to pounce when Pippin circled by). Chase is a good game. Elrond wanted to play too, but I think Pippin was intimidated by his size, and bark, even though Elrond was using what I think of as his silly high-pitched voice. Pippin is getting better about tolerating his Gentle Leader. Last night he made it through a whole walk (as opposed to a quarter), partly due, I think, to snacky distractions. Pippin also learned to hunt bed-mice last night. Another game he approves of, although we’re working on no digging for bed-mice. He plays fetch with a rope toy, too. Robin is another good toy – he can be nibbled on, he plays fetch, and he tolerates pouncing. This morning Elrond and Pippin were getting closer to playing. It seemed like Elrond was trying not to be too loud/scary; I think they’ll get it figured out sooner rather than later. Yes, that’s hair all over the bed. Elrond is badly in need of grooming. Ok, so on to fabric. Here’s the pictures of the fabric I got Saturday, each with a quarter for reference on print size. You can embiggen if you want, but it’ll be more obvious that I had focusing issues. Paisley/Floral combination. Yeah, apparently I was on a paisley kick. And here I thought I didn’t like amoebas on my fabric. This one just isn’t quite my colors. I still haven’t gotten my Japanese garb pattern from Reconstructing History, so I dropped them e-mail. Which reminds me, I did get my grey print to make a new kosode, and the big oriental dragon print fabric. I should get pictures of those, since I want to open the dragons up and see just how big the design is. Last week I cut out a pair of hakama and a jacket-thing for Licentia, which I started hand-sewing yesterday. The MuseCon program book is thiiiis close to being done, but I figure it’s actually faster to hand-sew than to wait until I get to the sewing machine again. Sunday evening we went to see Brave. It was really good, which I expect from Pixar. And very tear-jerking in spots. Friday night we’re going to see a park district production of Into the Woods at Cutting Hall. Trying the balcony this time. They’re appending a “Jr.” to the end of the title, so I’m assuming the cast is mostly kids. Bunch of other good stuff coming up over the fall/winter/spring, too. I like the first act of Into the Woods better than the second act, I think the messages get a little heavy-handed in the second act. Started John Scalzi’s Redshirts last week, zoomed through the first half the main novella, and have bogged down. I think it’s more due to being emotional than issues with the writing. Re-visiting some mental comfort food, in the way of Louisa May Alcott, will see if I can pick Redshirts back up in a day or so. Comments Off on Dogs, Fabric, Food, Etc. It’s a Monday. I can’t say I’m enthused. OTOH, we did get the taxes done yesterday, e-filed, and receipt has been acknowledged by both the state and feds. I do have to copy and mail Otter’s tax forms, since as per years past I don’t feel like paying $50-100-ish for the version of Turbo Tax that will handle putting lots of zeroes in the partnership forms for me while stepping me through all the requisite questions/steps to do so. We’ll be getting extra money back this year, as a result of choosing the high-efficiency furnace. Which I think means that the tax return should cover the repair of the exterior stair pit wall that we should have done last summer, but never arranged financing for. It may even extend to getting a patio installed to replace the back porch which we’ll have to remove to do said stair pit work. Meanwhile, Ron finally got a much-delayed annual review and raise. It isn’t a big raise, but the retroactive money for it is going toward a miter-every-which-way chop saw. The saw is not entirely necessary for construction of a new side porch, but will make the job a lot easier. I asked Robin on Friday how plans for the new porch were going, and pointed out that the weather is finally warming up enough to start work. It would be nice to use the side door again. Elrond seems to have caught construction fever, and has put himself in charge of excavation. He’s dug the occasional small hole over the years, but this one is special, and big. He started it Saturday afternoon, has been caught thinking about it several more times, and this morning came in with very muddy paws, from more digging around the large rock Robin put over the original hole after backfilling. Hopefully being put in his crate, being thrown bodily into the bathtub, then getting wet all over (I gave up, for various reasons, on trying to only get his paws wet), and being kept off of the bed and couch will be enough to turn Elrond off digging. But I’m not optimistic, so he’ll be going out on the cable, which doesn’t go out as far as the hole, for a while. Impressive lightning last night. It was flashing so much around 9 pm that I thought there was an emergency vehicle or some other strobe light out front (west). Even after looking outside and hearing what I thought was thunder, I ended up checking Weather Bug to be sure. And Mr. Courage the Cowardly Dog ended up in bed with me, I think for about half the night. Fortunately, he does share fairly well. Found a very neat app for the iPad – Zinio, a magazine (and book) reader. We now have subscriptions to “Saveur” and “Digital Photo Pro”, and Interweave’s “Knitting Traditions”, and Ron grabbed single editions of “New Scientist” and a tea magazine. It turns out “Knitting Traditions” is a special edition of “Piecework”, this is only the second one, and IIRC the first came out about this time last year (but I didn’t dig out my print copy to check) but the cost for the single issue was the same as a 4-issue subscription. So, we’ll see if they’re going to start publishing it a little more often, or if I have 3 more years of it. 🙂 Several of the magazines we looked at were set up so that you might as well just subscribe as only get one. There’s also desktop and iPhone version of Zinio, but not all the magazines are available for the phone. The iPad version is fairly good in terms of navigation and zooming. I’d like a simpler way to go back to the cover/first page, but it’s a minor thing. With some magazines you can choose to go to a view that’s just the text, instead of the page view, which is nice. I haven’t played much with the phone or desktop versions, so no opinions on those yet. The same account will work for the iPhone, iPad, and desktop versions. We’ve been on my phone and the iPad at the same time, it seems happy with access from multiple points at once. I need to clean up my laptop, the hard drive is getting full (although nattering about Zinio reminded me, it’s an unrelated topic). I have a bunch of Gutenberg documents I’ve downloaded to possibly read in the future, my plan is to delete them after making a list of titles/authors. I’ll also probably get rid of a bunch of digital photos – they’re already on the drobo, I don’t need duplicate copies of all of them on my machine. 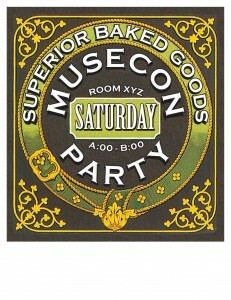 Here’s pictures of what we started with, and what I have, so far, for MuseCon party flyers. They’ve been saved as low-res JPEG files to put on-line here, the real versions look better (for instance, the penguin one is a bright magenta background). I think in part because of conversion to CMYK color. Click to embiggen. Within the post, keep scrolling down, there’s white space because of page-layout under the penguin and baked goods ads. More yammer follows. Ignore the relative sizes of the befores and afters, I just exported quickly from Photoshop and InDesign. I’m particularly pleased with this last one. It was a *lot* of work to get to this point after de-wording. It’s a total of 10 layers, with various directions of texts on paths and shadows, and whatnot. InDesign didn’t want to do a drop shadow on text an a path (at least that I could see), so I did it the Brute Force Enthusiasm Method. And then went back and gave the center text a Brute Force Enthusiasm drop shadow also, so it would have a consistent look. Looking at the original and my version together, I see some things I want to tweak on mine. And now, off to bed. Still tired, although otherwise down to minor snuffles and itchy throat. The texture repair trick in Photoshop was successful. My de-worded poster looks better now, although it took a lot of poking at testing to figure out what texture would work best. And it was something Ron hadn’t used, so I got to show him how to do something. I sorta-kinda figured out content-aware scaling, although I only got it to work successfully on a tiny test image, I ran into memory issues when I tried it on the intended “Mr. Slushy” image I wanted to use it on. When Ron got home he showed me better ways to use the scaling (I was working off an Adobe web page, not a great source), I was making it more complex than it needed to be. 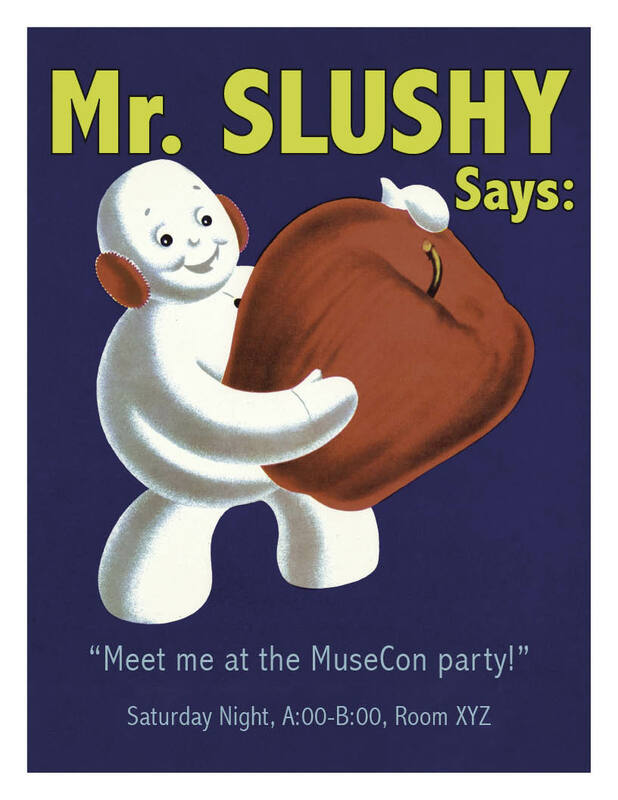 By that time I’d re-sized the Mr. Slushy image the “old-fashioned” way (scale the whole thing a little bit then cut and paste on background bits where I needed more and fix the seam), and created two versions of the party flyer from it. My attempt to de-word another Art Nouveau poster was not successful. I remembered to put my work on a new layer, but I forgot to make another new layer for some very fiddly editing/image re-building, so when I decided I needed to roll back to the original in just that area, there was no good way to do so. Fortunately, I’d started with the fiddly bits, so I didn’t lose much. I think for that one I’m going to have to not try to use cloning, and go in and start painting. Or some hybrid of cloning and painting more like painting. Yes, I know, pictures would help. I should post some, shouldn’t I? I also picked out 4 more labels to poke at. The first features a penguin, and some bits of ice, plus words on a nice smooth magenta background. 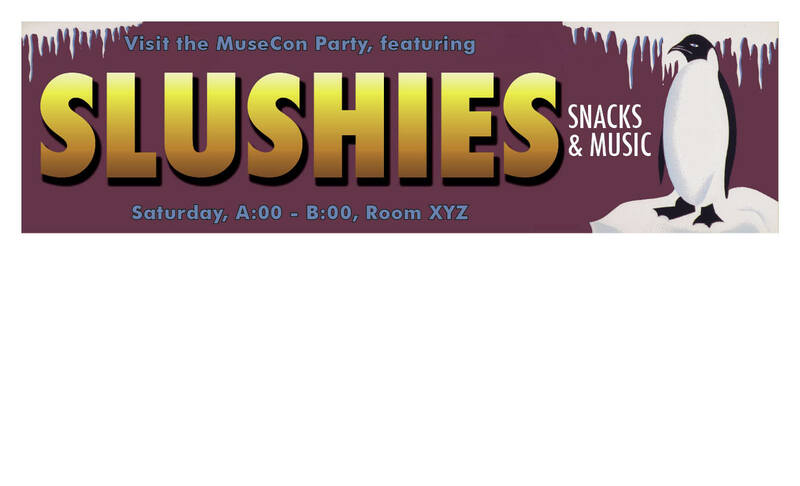 That one was easy to strip the old words out of, so now it’s another slushy-themed party flyer, which looks like a bumpersticker. I spent more time poking at a gradient and drop shadows than I did cleanup on that one, even with Ron running me through it a second (simpler) way. It seems that I don’t learn well watching Ron do things, even slowly. I need to drive. 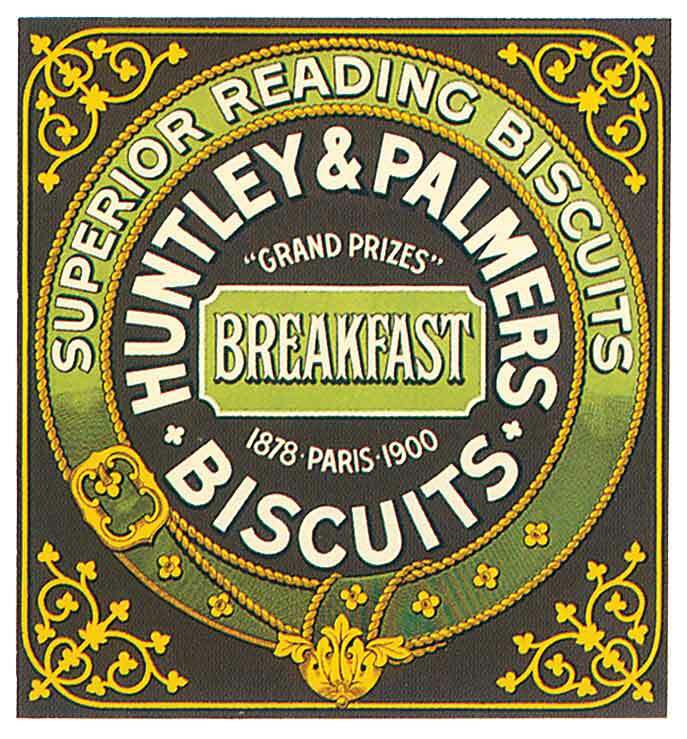 The next ad was for some kind of biscuits. I thought it was going to be hard to de-word. Ron said no, it would be really easy. Well, that was easy. I need to learn the power of layer masks. And I remembered Ron’s re-touching book walked through making a custom pattern/texture to do the trick I’d learned and used earlier. This ad wasn’t very big, but I got Ron a piece of software that does fractal magic to re-size images (student discount FTW!). Very very spiffy. Now I just have to figure out what I want that ad to say. And put a bunch of words on semi-circular paths. 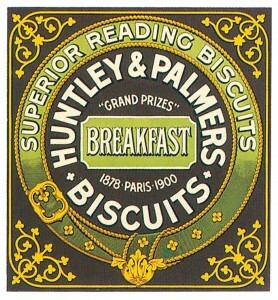 With drop shadows. (Why yes, I am going for the same look and feel as the original ads, even if people seeing mine won’t know it). 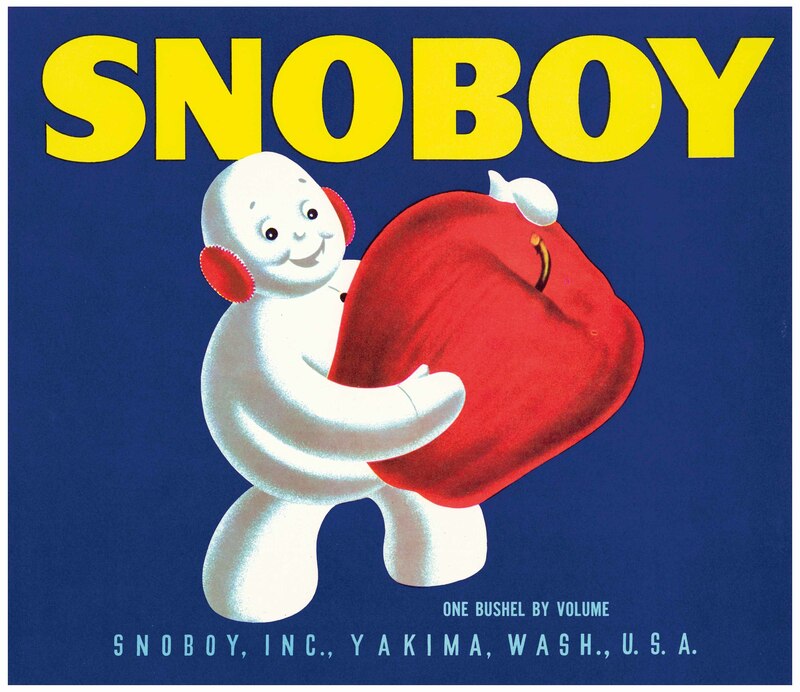 The third image is a bear operating a wine press, which wants to be another slushy-themed party flyer, I think. It’s going to be a trickier one to de-word, but Ron pointed out that instead of trying to fix parts missing due to the original words, it’ll be easier to just erase it and start from scratch (a semi-circle and concentric lines around it forming a setting sun). 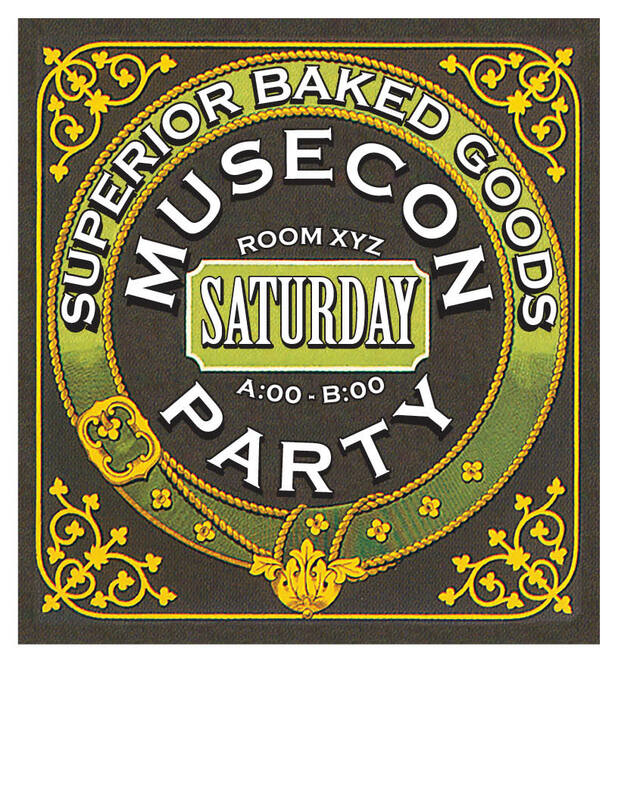 The last one just needs to be blown up and have something about the MuseCon party pasted in – it’s a partially-blank generic label for “superior pastries” or something like that. Hopefully I haven’t wandered off the deep end in my party flyers. *I* like them, and Ron and Robin seem to, but I’m not convinced we’re impartial. 🙂 I’ll take my laptop to the ConCom meeting Saturday afternoon and see what others think. We also have three more Dover books on the way – WPA posters, SF & Horror movie posters, and SF movie poster cards. Unfortunately, only the WPA posters comes with a CD, IIRC. But we have a scanner and the re-size software, woo-hoo! Ron gets first dibs on the SF & Horror stuff for Capricon Cafe flyers and decorations. Yesterday I did get key lime pie made. Fortunately, we still had our lever-action citrus-squeezer, so juicing a dozen or two key limes wasn’t difficult. I even succeeded in whipping cream into whipped cream, not making butter (although almost-butter isn’t too bad on pumpkin pie, it would be just wrong on key lime pie). Ron thinks the pie could have used more lime flavor, but it’s good as is. Picked up Christmas dinner, Christmas Eve dinner, and other goodies yesterday at Heybeck’s. I didn’t have anything in particular in mind for Christmas dinner, so when Ron offered me a boneless leg of lamb, I didn’t argue. Ron suggested potato sausage for Christmas Eve, and I almost went into a panic when there was none in the case. Fortunately, they had more stashed in back. Now I just need to get some rutabagas. Potato sausage and mashed rutabaga is an Ohman Christmas thing. One of the other goodies was a piece of smoked salmon. Oh boy, was that good! Robin was an instant convert. We also had a moment of madness and went to Deer Park Towne Center. WTF were we thinking, less than a week before Christmas?!? Our defense was that Ron was in search of a new corkscrew, we weren’t thinking about Christmas shopping. Although we did find my Christmas present at Williams-Sonoma. I’d been waffling between a dressmakers’ dummy (Ron thought it was too practical, and I waffle if I’ll use one enough), and an iPad (pricey). I’ve been trying to ignore the Shun rocking knife in the W-S catalogs, but they had one in the display case. I asked to try it. It followed us home. So then this morning I had e-mail that one of my favorite sock designers, Cookie A, has a sock club for next year. Argh! Timing! I’d have pointed at the sock club if I’d known about it. Sock yarn and 2 patterns (easier and harder) every other month. I did order her latest sock book “Knit. Sock. Love.” this morning, but PDF and print, since she had a sale: buy the print copy and get the PDF for just $6. So the PDF is on my phone, and I can print out the relevant pages without scanning them first, and still have the print book for browsing. Which brings me to a book-related rantlet. First, the background: I signed up for the Graphic Arts 102 class a week or so ago, but hadn’t gotten to the bookstore yet. I looked on-line today, and the section I’m in doesn’t have books listed specified. But the other section lists a book I got for GRA101, and another one that’s only available used, Copyright 2005, for $15. Now, this is an Adobe InDesign book, so 2005 is oooold. Peachpit Press, the publisher, doesn’t even list it any more. B&N doesn’t have any new copies. But hey, their used sellers have it from $2-$5-ish. Oooh, “like new” for $1.99. Even with paying $3.99 shipping, it’s a better deal than the Harper bookstore. 4-14 day shipping, but class doesn’t start until January 18th, so I’m good there.